Even though men are more likely to lose their hair than women, but thinning hair and hair loss are also common in women, and very demoralizing for women. There are different reasons for female hairloss. It can range from a vitamin deficiency—to the more complex, like an underlying health condition. Any type of physical stress on the body like surgery, a car accident, or a severe illness, even pregnancy can cause hair loss. This can cause a type of hair loss called telogen effluvium. The hairloss is distributed shedding of hair across the scalp. It can occur at any age; its onset can be quite sudden and is often noticed by an increase of shedding hairs during washing or grooming. Usually seen with widespread decrease of hair density, instead of a bald patch. Female-pattern hair loss, called androgenic or androgenetic alopecia, is genetically predisposed hairloss. The follicles begin to produce hair of a shorter growth cycle and continue growing weaker and thinner with each succeeding cycle. This is the female version of male pattern baldness. The hair parting begins to widen. Hormonal changes in women can cause hairloss, even being on and off birth-control pills or menopause. The hair follicles minimize and more hair shedding occurs. Sometimes emotional stress can cause hairloss. Usually when someone is under extreme stress for example death of a loved one or a divorce. These problems can contribute to hairloss. Your doctor can preform a blood test to check your iron or thyroid levels. Also known as Alopecia Areata. Approximately 2% of the population develop this condition. There are one or more patches of reversible baldness. The immune system attacks this hair follicles mistaking the hair as foreign. 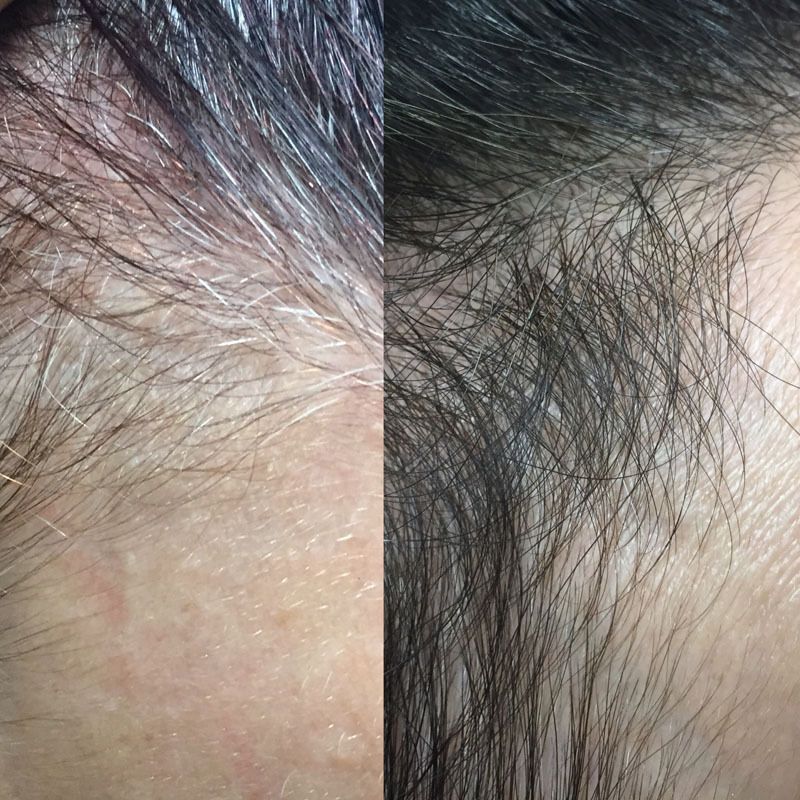 Sometimes in more severe cases this can lead to Totalis (total scalp hair loss) or even Alopecia Universalis complete loss of all scalp and body hair). Treatment may improve the rate of growth of hair growth. Sometimes sudden weight loss can cause physical trauma to the body, which in turn causes thinning hair. Not eating correctly can cause vitamin and mineral deficiencies. Also conditions such as anoroxia or bulimia can cause hairloss. Unfortunately some of the side effects of medication or treatments used can also cause your hair to fall out. For instance like cancer treatment. Also other medication can effect hair. Common medications like blood thinners and the blood-pressure drugs known as beta-blockers. Other drugs that might cause hair loss include methotrexate (used to treat rheumatoid condition and some skin conditions), lithium (for bipolar), some anti-inflammatory drugs, and possibly antidepressants. Continuous traction to an area of the scalp can cause this type of hair loss. Most commonly women suffer from this type of hair loss. When they are subjecting some area of the hair to frequent stress such as braids, headbands , or tight rollers all cause hair loss at the site of tension. Afro hair type is prone to this type of hair loss. Certain conditions on the scalp such as Seborrhoeic Dermatitis can lead to some hair loss or thinning. Generally this is due to itching, Causing the one to scratch scalp. This build up can cause soreness and inflammation. Topical treatments are ideal to treat this condition. This refers to various skin disorders that destroy the follicle leaving behind scar tissue. This can lead to permanent hair loss. 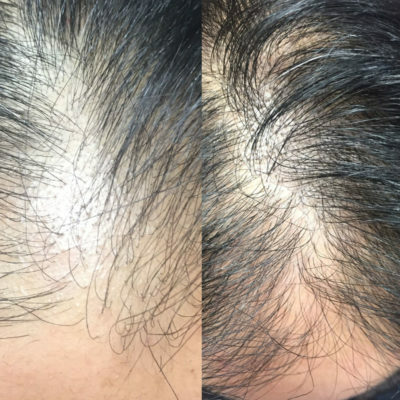 Low level laser hair loss therapy is now recognized worldwide as an effective treatment for most forms of hair loss, including male and female baldness. It is suitable for anybody who is in early stages of thinning. It is often combined with a complete hair loss program for full potential. During the treatment the diodes omit a specific wavelength and frequency of light, delivering low level light therapy to the hair follicles. You do not feel anything and a session takes approximately 20 minutes. Repeated treatments are required for an extended period of time for full benefit. PRP is a therapy that uses patients own blood to stimulate a healing response within a damaged tissue. Apart from red blood and white blood cells, our blood contains cells called platelets. The function of the platelets is to promote healing and aid in clotting of blood when a wound occurs. These platelets contain growth factors that promote regeneration of the cells in the body. PRP has been used in medicine for over twenty years. PRP increases blood circulation and provides nutrition to the hair follicle. 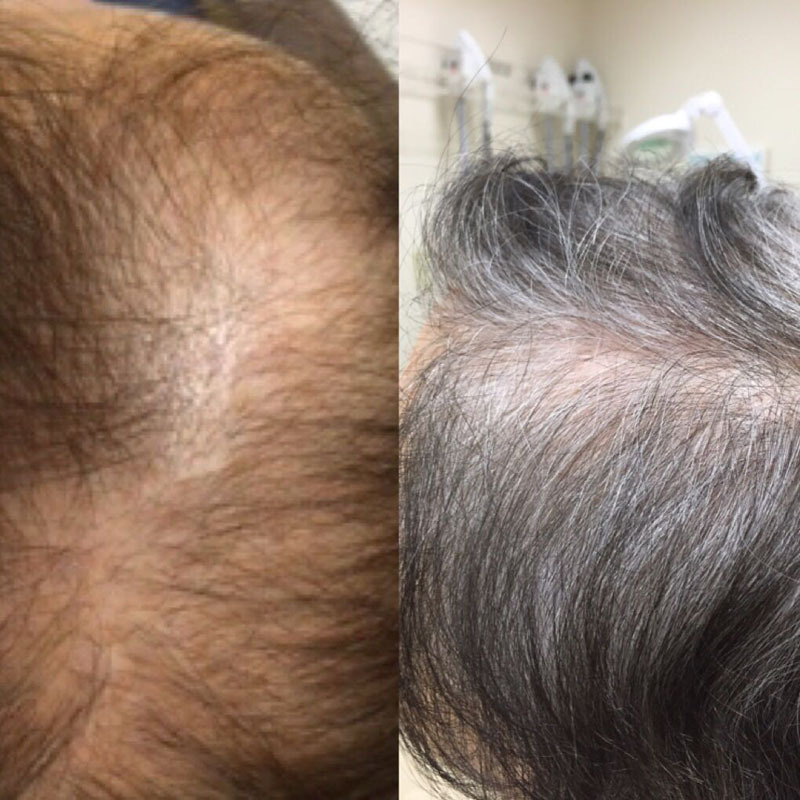 When we provide platelets via PRP in the area of damaged follicles, it increases the body’s natural wound healing mechanism thus stimulating hair growth. Derma pen is a form of micro needling treatment which stimulates hair growth. Hair vitamins are also infused during the Derma pen treatment. The hair vitamins are composed of hyaluronic acid and hair complex. Even improving scalp conditions such as, scalp dehydration, dandruff, hair breakage. Hair restoration has developed enormously. 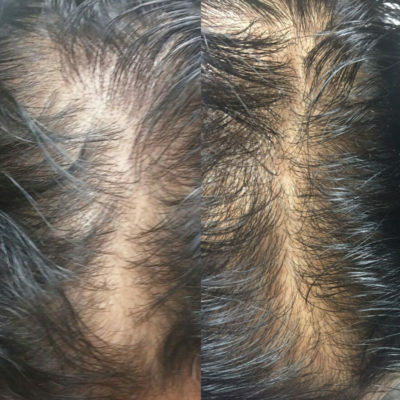 Transplants performed by skilled doctors produce natural looking results and is a more long term solution to hairloss. It is a minor surgical procedure. Healthy hair from the back of the scalp is used as to donate for the procedure. The hair is removed from this donor area and the follicles are separated into individual and multiple grafts. These grafts can be as tiny as one or two hairs. The scalp is then anaesthetized and the grafts are placed in the skin. The process of graft insertion can take a few hours. Once transplanted, these hairs continue to grow normally. On occasion some people may require more than one procedure. This will be explained during your consultation with the physician. I’ve always had thin hair but a few months ago I noticed my hair was shedding a lot. One evening while I was playing with my 4 year old daughter, she said, “Mommy, I can see your brain”. After she said that, I knew I had to take action. I googled, Hair Loss Treatments in Vaughan and I found Redeem Medi Spa I called them and setup an appointment for a consultation. During the consultation they were very knowledgeable and professional, so I knew I would be in good hands. To date, I’ve had 4 PRP treatments and 10 laser caps. It’s been 4 months since my 1st PRP treatment and I am extremely happy. Oh, I should also mention, my daughter has not said that comment again. 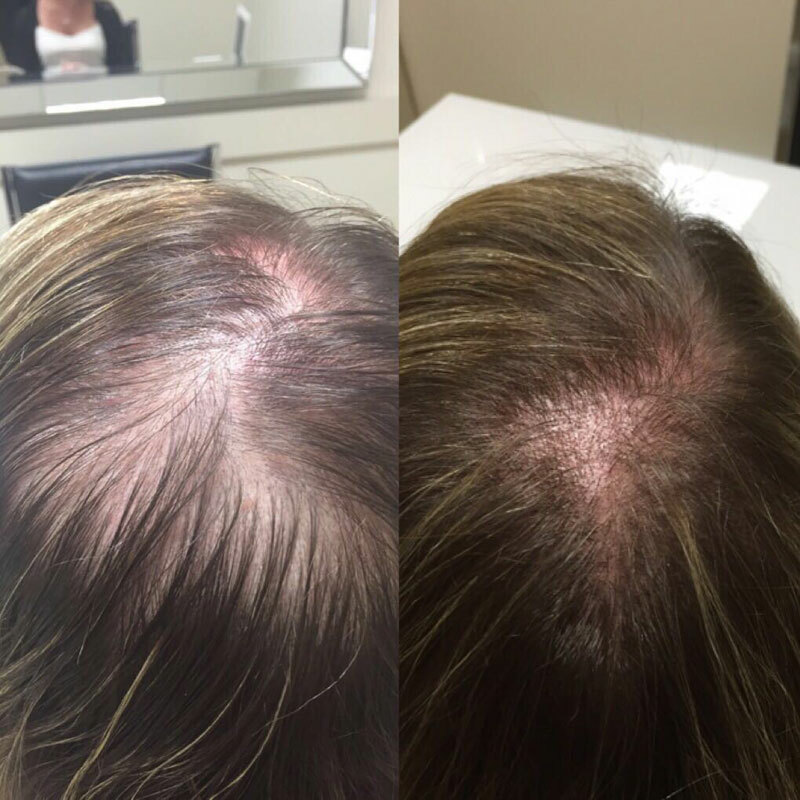 Come in for a free no obligation assessment to learn more about Hairloss in Women treatments and if you are the right candidate to receive Hairloss in Women.